The liberals at Google honored radical environmentalist Rachel Carson on their home page, Tuesday, in honor of what would have been her 107th birthday. With the Google logo in the background, an illustration featured the late Carson in the wilderness, next to birds, turtles and butterflies. Clicking on this picture will bring web browsers to a search of all things Carson. Journalists, Al Gore and Hollywood have long lauded the activist. But few of them have questioned her accuracy or impact. Carson's claim to fame came when she published Silent Spring in 1962. The book warned of the dangers of pesticide to birds and lobbied for banning the chemical DDT. However, this contention turned out to be flat-out wrong and has had deadly consequences. As San Jose State University entomologist J. Gordon Edwards explained: "This implication that DDT is horribly deadly is completely false. Human volunteers have ingested as much as 35 milligrams of it a day for nearly two years and suffered no adverse effects. Millions of people have lived with DDT intimately during the mosquito spray programs and nobody even got sick as a result." The left wants to tell children a story about the founding of modern environmentalism, but their fairy tale version ignores the grim reality. 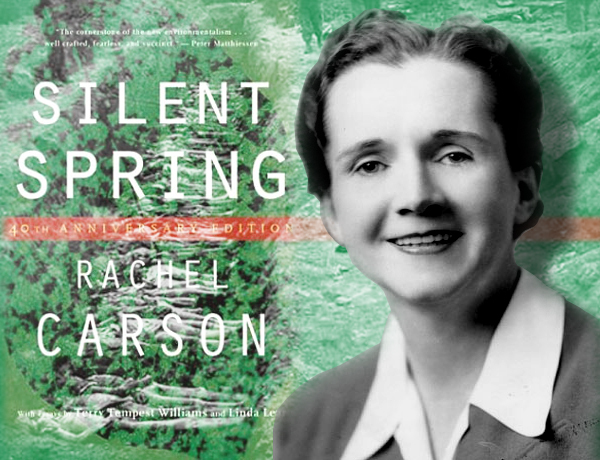 Storybooks abound about Rachel Carson, the marine biologist who wrote “Silent Spring” nearly 50 years ago. In fact, there are 130 children’s books about her available through Amazon.com that teach children to idolize Carson and how to become liberal activists, but without telling them the lives that could have been saved by DDT. Some of those books even promoted left-wing environmental groups like the George Soros-funded Natural Resources Defense Council. A new school will be opening in Los Angeles next Monday that is named after Nobel Laureate Al Gore and Rachel Carson, the woman almost single-handedly responsible for DDT being banned in the '70s. Under the headline, "Happy Birthday, Earth Day," the April 18 edition provided no information on the negative impact of Carson's efforts. Instead, editor Betty Debnam enthused, "In 1962, a scientist, Rachel Carson, published a book called 'Silent Spring.' She caught everyone’s attention with her accounts of birds dying from pesticides. She warned that people were in danger too." Debnam made no mention of the fact that Carson's "warning" was wrong. The National Academy of Sciences has called DDT the "greatest chemical ever discovered, a lifesaver of 500 million whose deaths were otherwise inevitable." Carson's claims that the pesticides could be linked to cancer have been thoroughly debunked. Yet, the Mini Page spun this activist as a hero to children across the country.